This new smart pillbox named CYCO is making headlines after being funded in just 24 hours on Kickstarter. Why? Because managing a daily medication schedule with memory alone is tough! Many have experienced the hassle of fumbling with multiple medications throughout the day, forgetting which medication to take and at what time. Do you find yourself asking, “Did I take that medication today?” If you answered yes, then CYCO can help you stay on track with your medication cycle – which is exactly where it got its name. You have a lot to remember every day, so it is very easy to forget medication or to occasionally skip doses. Even if you remember to take your own medication, your loved ones may not always keep such a disciplined schedule. However, the inventors of CYCO believe that tracking your medication cycle should not have to be such a hassle! Automated scheduling, dose indicators, and dual sensors eliminate errors while taking your medication and keep caregivers in the loop. Taking medication perfectly as prescribed is a daily challenge, but this is extremely important to the overall effectiveness of any treatment process. This means taking the right dose, at the right time, frequently enough. It can be hard to keep track of all this information, especially when you’re taking several medications multiple times each day. CYCO makes it easy by keeping track of your schedule and reminding when to take which medication. It can even send activity information to your family members or caregivers. 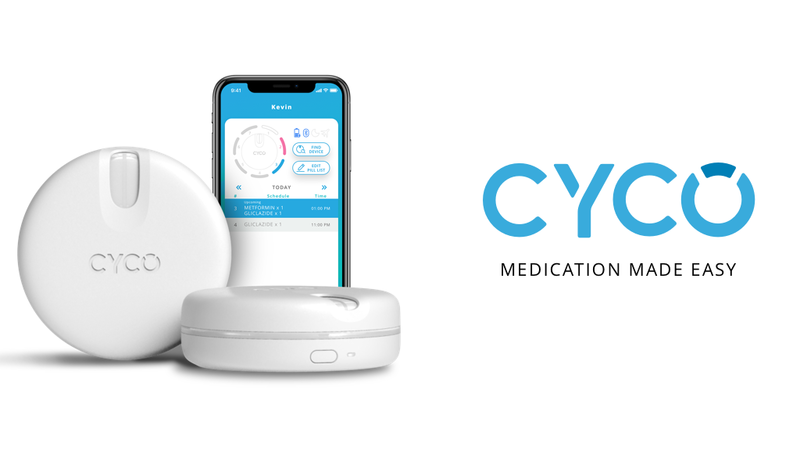 Not only does CYCO incorporate an innovative app to create an accurate dose schedule, CYCO also integrates a double sensor alert system with visual and audio aids so you can enjoy a stress-free medication cycle. CYCO can be set up in just a few minutes and gives you the peace of mind that your medication is being taken properly. It even allows you to monitor your progress or share that information with caregivers and loved ones. CYCO makes it easier than ever for you and your loved ones to stay on top of their medication schedule; from the LED indicators showing which medication to take to the 7-day medication container. Double sensors detect and notify whether your medication is taken from the right slot. Additionally, an audio alert will trigger if you turn the dispenser to the wrong medication compartment. The CYCO medication organizer and app give you complete control. Guided assistance along with audio and visual alerts ensure you and your loved ones take the right pill at the right time. Simply input the name, dosage, and frequency for your medication and CYCO will generate a schedule. We went through several prototypes and revisions on the way to creating the perfect smart pillbox. After each iteration, we still felt like there was something missing. CYCO could be better and needed to be better. With our final design and prototype, we realized we had finally created the type of pillbox we wanted our loved ones to have, that we wanted to bring to the market. It’s been a long, exciting journey developing CYCO and we’re looking forward to getting the pillbox and app into the hands of all of our backers. With your help, we can revolutionize the way medication is taken and help to transform people’s lives. Previous articleUlzi App – Over 100% Funded in 24 Hours!